You know, local newspapers and electronic media do a pretty good job of keeping us informed on local events. On national events, not so much. Take, for instance, the case of Virginia Gov. 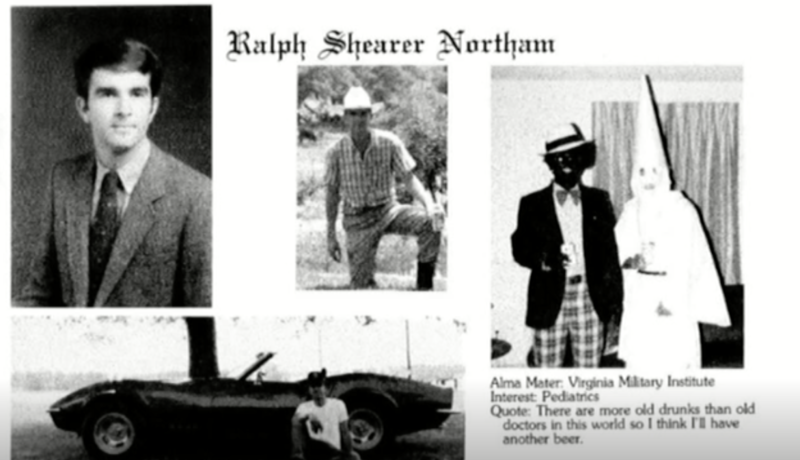 Ralph Northam, a Democrat. He is accused of, has admitted to and then disavowed being in a picture in the 1984 yearbook of Eastern Virginia Medical School. The picture in question shows one person in “blackface” and a second person in a white sheet, symbol of the Ku Klux Klan. Anyone who knows me knows I don’t tolerate for one second racism from any source. By the same token, I don’t unplug my brain just because it’s politically correct to do so. Even if true, the incident occurred 35 years ago while the governor was in med school. If there is a tougher school to graduate from than med school, I don’t know what it is. Your life is not your own, and the hours are so long you don’t have much time to relax. When they can, college kids may do things to relax that wouldn’t take place in a regular environment. This does not excuse collegiate stupidity but can explain it in context of what was taking place at the time — blowing off steam while completing a demanding education. For the past week, all of the TV commentators (who have surely never sinned in their lives or told an off-color or even “colored “ joke) have called for the governor’s head. These self-proclaimed experts demand that he resign. They conveniently ignore earlier reports that he has been a good governor and has worked well with the African-American community. He also chose a man of color as his lieutenant governor. If it truly is the governor in the picture, I still do not join the extremist (yes, in fact racist) critics who want him to resign. Look at the man’s entire life, what he has accomplished and the fact he received over a million votes … and a true picture emerges. Yes, like many of us he may bear a few scabs he wishes did not exist, but he remains a good man. Let’s look at President Donald J. Trump. In federal court, he was found guilty of discrimination for refusing to rent to African-Americans in his Trump properties. There’s no doubt here. It’s a matter of public court record. Given that the case against Trump is not in doubt, where is the outcry for his resignation from office? Of course, it’s not fair to compare Gov. Northam to Trump because Trump has so many disqualifiers that he never should have been elected. It begs the question, though: Why Northam but ignore Trump? God, are there really that many Russian sympathizers in this country? Is the population of this country so blinded by hate, racism and Putinism that common sense no longer exists? I still think as an American, not a Russian pimple like so many in our federal government — appointed by Trump, not elected by WE THE PEOPLE. I suggested the national media has lost its focus, and that’s exactly what I meant. While it repeats the same stories over and over ad nauseum, it ignores the much larger picture. What is the current status of recovery in California, the Carolinas, especially Puerto Rico? You know, the territory that was ravaged by Hurricane Marie and then abandoned by the Trump administration because it had a female mayor who didn’t take his guff. How about the Carolinas, where the floods were indescribable until coverage just stopped … and last, but not least, California, which suffered the greatest fires in its history. California, where the president said in front of the state’s cowardly Rep. Kevin McCarthy that he wanted to pull financial aid from his state because the fires were “caused by lack of forest management.” If there was ever a time for the elected representative of the people of California to tell the president to stuff it, this was that time. McCarthy didn’t. You see, there are people who are suffering on a continuing basis, in need of help from the federal government but not getting it. These are real, continuing disasters. The government doesn’t tell us what’s happening, and the media no longer is following the stories. Recently the national media barely has given lip service to the atrocities committed at our border with Mexico. No, I do not refer to those people streaming toward our country to avoid horrible life-threatening situations in Central America. I refer to the bastards in our government who jailed children after separating them from their parents and now have no way of reuniting families because the Trumpsters didn’t have the brains to plan reunification or even the common sense to design a plan to follow those apprehended. I call their Gestapo tactics criminal — and some individual or individuals belong in jail. You don’t have to be a brain surgeon to know if these people were all white (say, from Fargo) that Homeland Security would have had a process in place to follow each individual and family with a plan to reunite. Of course, the idea of separating families itself was a mean-spirited act of incompetence and stupidity. Let’s face it, this is a process that Russia might follow … and so it’s no surprise that their puppet Trump would. Where the hell are the adults in government, the American Democrats, the American Republicans and the American Independents? Will no one stand up to this goose-stepping administration until it’s too late? If Trump was given a psychological and psychiatric examination, I believe he would be deemed unfit to continue in office. That, of course, would leave Vice President Pence in charge. But if he, in turn, was told to resign or be criminally charged with his own crimes, he’d run like a dog in heat to get out of the White House. Geez, that would only leave Nancy Pelosi to head our country. Imagine that. Amen. Thinking that someone should resign is a lot less complicated than figuring out how to deal with the complex aftermath of destruction. The governor situation is the path of considerably less resistance.